Recently, it was reported that a Ken Robson, a patient in the United States, who wasn’t feeling well, used heart rate data captured by his Apple watch, in addition to searching on Google, to self diagnose a heart condition. The hospital he visited confirmed the self-diagnosis and provided the necessary care. This episode was hailed as an example of ‘new medicine’ on social media by Dr Eric Topol. Whilst I’m all in favour of empowering, engaging and activating patients in the 21st century, I believe we need to not throw caution to the wind, and adopt a considered approach when thinking about the role of emerging technologies in the healthcare system. On this occasion, Robson’s self diagnosis using a combination of data from a device that hasn’t been clinically validated, and information from a Google search, turned out to be right, is this really the future of ‘medicine’? Even Robson admits, “This was one of the rare instances where the patient was right in self-diagnosis.” Whilst the 2 weeks of historical heart rate data from Robson’s Apple watch played a useful role in this particular medical encounter, I’m not convinced that the benefits outweigh the risks of patients & doctors relying upon data from consumer fitness tools such as the Apple watch. I’ve tested wearable technology such as the Apple watch and numerous other watches, and found the heart rate data is not always reliable. 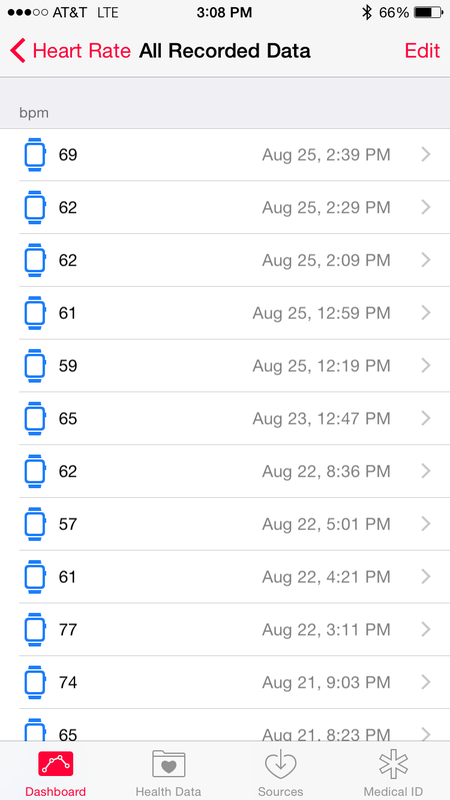 Even last night, while exercising in the gym, and out of breath, glancing at my Apple watch, the display showed a clearly incorrect reading of 58bpm. If I visited my doctor every time I noticed strange results from the array of consumer health tools I’ve tried, I’d probably be in my doctor’s office every few days. Luckily, I don’t entirely trust the data from these devices as I acknowledge that these are not medical devices, and that these data are often masquerading as evidence. As these devices continue to proliferate, and patient generated data expands in volume, we may need to re-examine what evidence means in this new age. In the quest for patients to take responsibility for their own health, and self-diagnosis becomes more prevalent, there are immense challenges surrounding trust, quality and accountability. The marriage of clinically validated data in electronic health records and data from wearables may be the holy grail, but the journey is likely to be a messy one. Just because an invention is new, shiny and innovative doesn’t automatically make it valid for use in healthcare. In the rush to transform healthcare systems, reduce spending & improve patient outcomes, it would wise not to equate perception with reality. I think your conclusion is generally right that we need better devices and much more data to validate patient generated data before it can be used reliably. But I would clarify 2 things about your observations. The first is that my watch showed numerous and regular heaetbeat readings in the 30’s and 40’s and also spikes up to the 140’s – 160’s. The other is that I did in fact have episodes of light headedness and lack of energy. While in the hospital, when the watch was properly on, the heart beat readings matched the telemetry readings beat for beat. One other note. The professionals at the hospital were appropriately skeptical – and I thought that was exactly right. But, it was fascinating to see these front line providors reactions as they begin to see the possibilities that likely lay ahead.